NASA astronaut Jeffrey Williams, Expedition 22 commander, exercises using the Advanced Resistive Exercise Device (ARED) in the Tranquility node of the International Space Station (Credits: NASA). Eating right and exercising hard in space helps protect International Space Station astronauts’ bones, a finding that may help solve one of the key problems facing future explorers heading beyond low Earth orbit. A new study, published in the September 2012 issue of the Journal of Bone and Mineral Research, looked at the mineral density of specific bones as well as the entire skeleton of astronauts who used a new, stronger “weight lifting” machine. Of course, weights don’t really “weigh” anything on the space station but resistance machines allow astronauts to get the same kind of workout. The new Advanced Resistive Exercise Device (ARED), installed in 2008, doubles the maximum simulated weight to as much as 600 pounds. Researchers compared measurements from 2006 until 2008, when astronauts used a less capable workout machine. They found that astronauts using the advanced system came home with more lean muscle and less fat, and kept more of their whole body and regional bone mineral density. Those same astronauts also consumed sufficient calories and vitamin D, among other nutrients. These factors are known to support bone health and likely played a contributing role. “After 51 years of human spaceflight, these data mark the first significant progress in protecting bone through diet and exercise,” said Dr. Scott M. Smith, NASA nutritionist at the agency’s Johnson Space Center in Houston and lead author of the publication. Since the 1990s, resistance exercise has been thought to be a key method of protecting astronauts’ bones. Normal, healthy bone constantly breaks down and renews itself, a process called remodeling. As long as these processes are in balance, bone mass and density stay the same. Earlier studies of Russian Mir space station residents found an increased rate of breakdown, but little change in the rate of regrowth, resulting in an overall loss in bone density. In the new study, astronauts who used the ARED device still had increased bone breakdown, but their bone renewal tended to increase, likely resulting in a better balance in whole bone mineral density. “The increase in both bone breakdown and formation suggests that the bone is being remodeled, but a key question remains as to whether this remodeled bone is as strong as the bone before flight,” said Dr. Jean Sibonga, NASA bone discipline lead at Johnson and coauthor of the study. Bone density loss in astronauts on long-duration missions has been a major medical concern. In the past, astronauts have lost an average of 1 to 2 percent per month. By comparison, an elderly person, loses about 1 to 2 percent per year. This study shows that, through proper exercise and nutrition, crew members on long journeys in space can return to Earth with much less loss of bone mineral density. But a key question remains as to whether the bones are as strong as when the astronaut launched into space. For these and other reasons, additional studies to evaluate bone strength before and after flight are currently under way. Beyond bone strength, further study is needed to figure out the best possible combination of exercise and diet for long-duration crews. One experiment on the space station right now is looking at how different ratios of animal protein and potassium in the diet affect bone health. Another is looking at the benefits of lowering sodium intake. NASA food scientists have reformulated more than 80 space foods to reduce the sodium content. 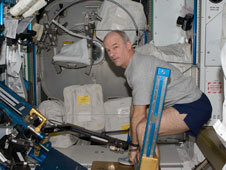 To see interviews with researchers on this topic, view Exercise Prescriptions Important on Space Station.